For Part 5 of the course I followed a different path than in previous course work and left off posting anything onto my online learning log until the last minute. I felt that this time I wanted to concentrate on the work itself rather than the technology of posting material to the learning log. 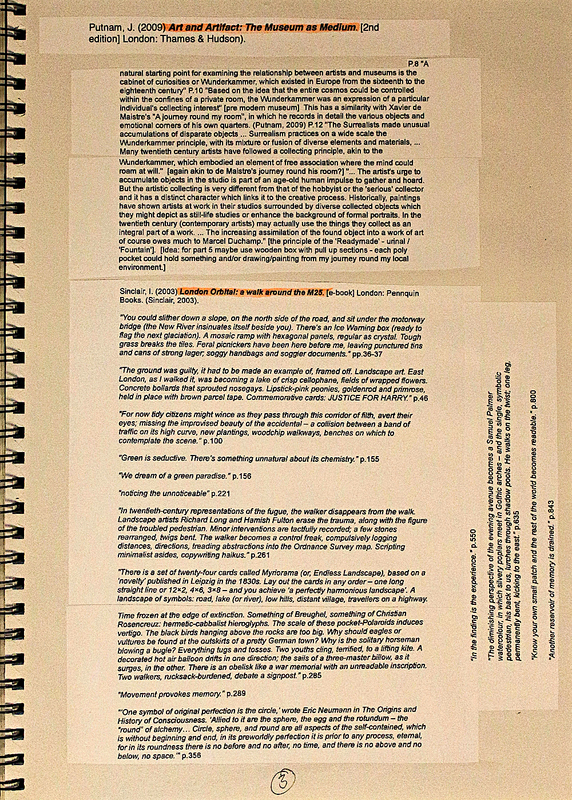 In my notes (see below) for this piece of course research and also in my notes in preparation for my Part 5 essay (see https://stuartbrownleeocaupm.wordpress.com/2017/06/27/part-5-essay-research/), I somehow managed to fall into my usual trap of following tangents, particularly in my reading matter. 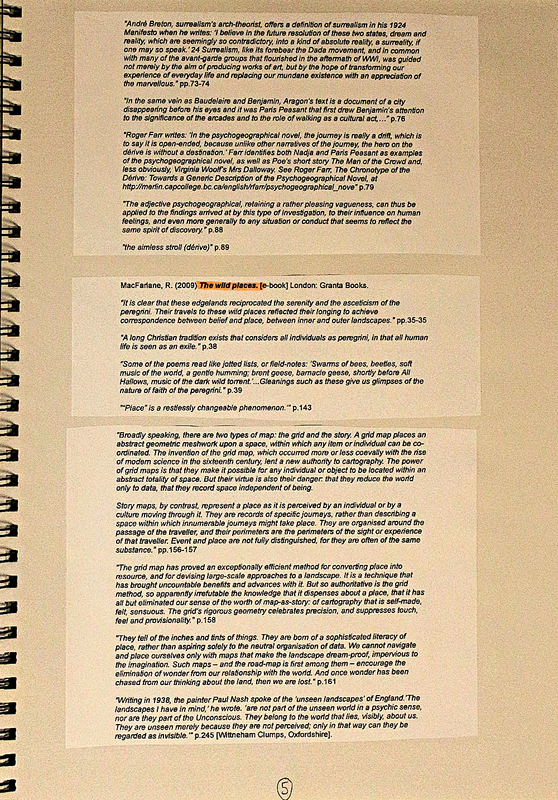 However, I believe that in leaving the write-up of my course work to the end (last week of June prior to 3 July deadline) it has allowed me to take in a wider overview and perspective on what I have been exploring during the research, the course exercises and the final assignment. In some way, a more holistic approach. 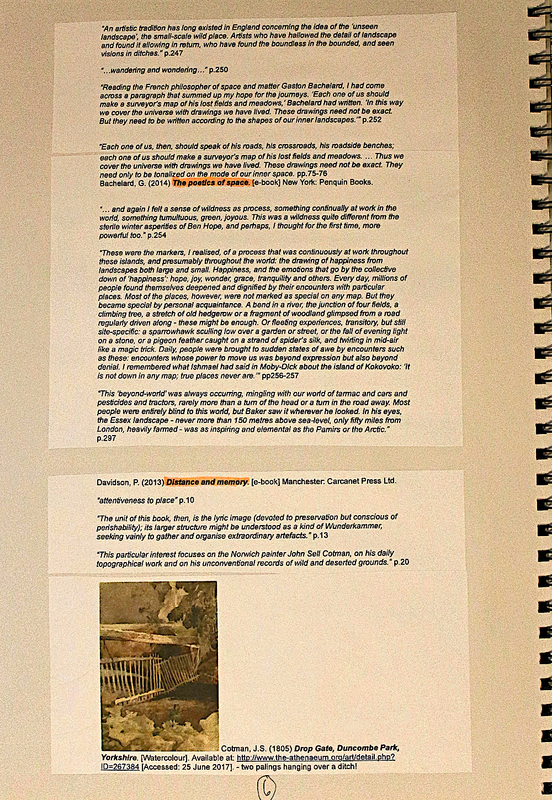 So, for the research write up I am drawing on the notes, images and text from the last two months since I started Part 5. 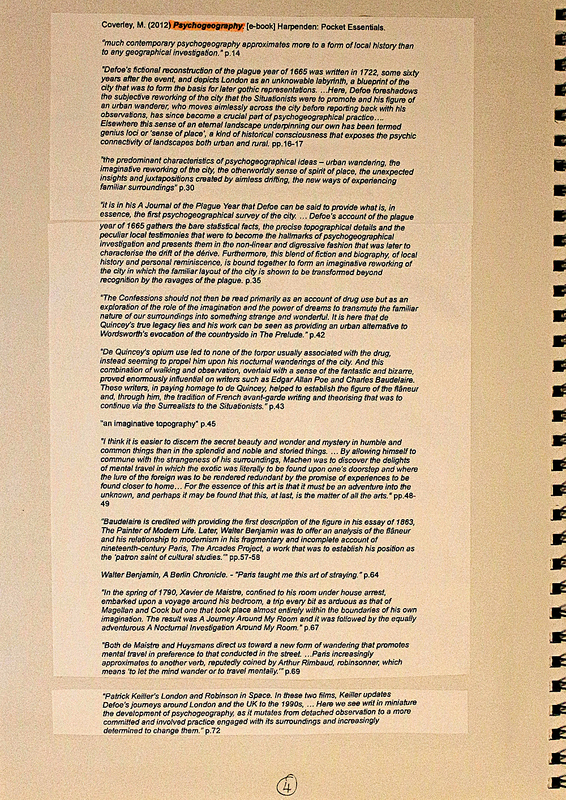 As can be seen from my research notes below, and in the notes for my essay, I looked at more artists than were mentioned in the brief. I found the task of focusing on three artists particularly challenging and have much more supporting material than it is possible to cover here in the space and time available. 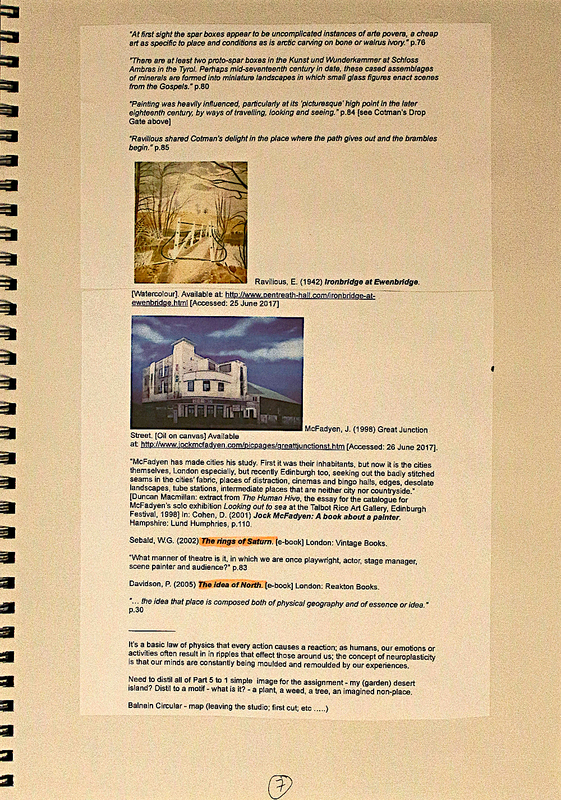 For example, I have notes on all of the artists mentioned in the brief and elsewhere in the course material stored on my online Evernote account, which I continue to populate and refer to. 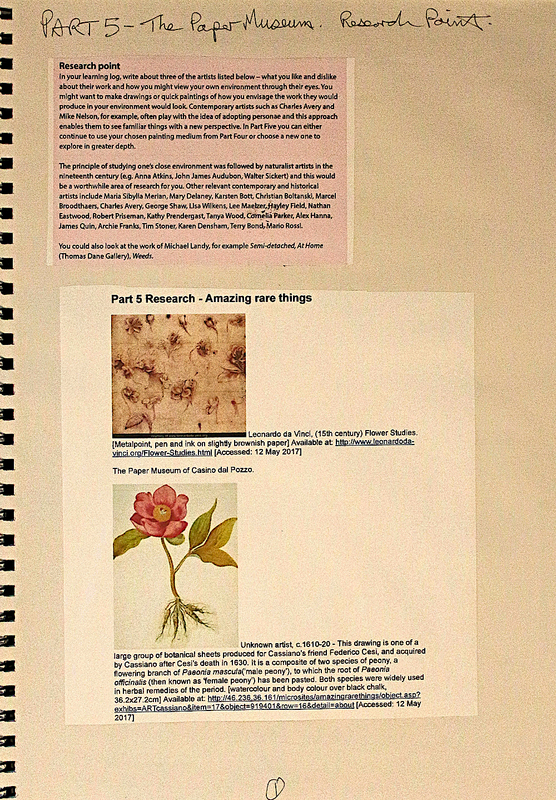 But a selection of three artists must be made according to the research brief. So here goes. Available at: http://www.leonardoda-vinci.org/Flower-Studies.html [Accessed: 12 May 2017]. 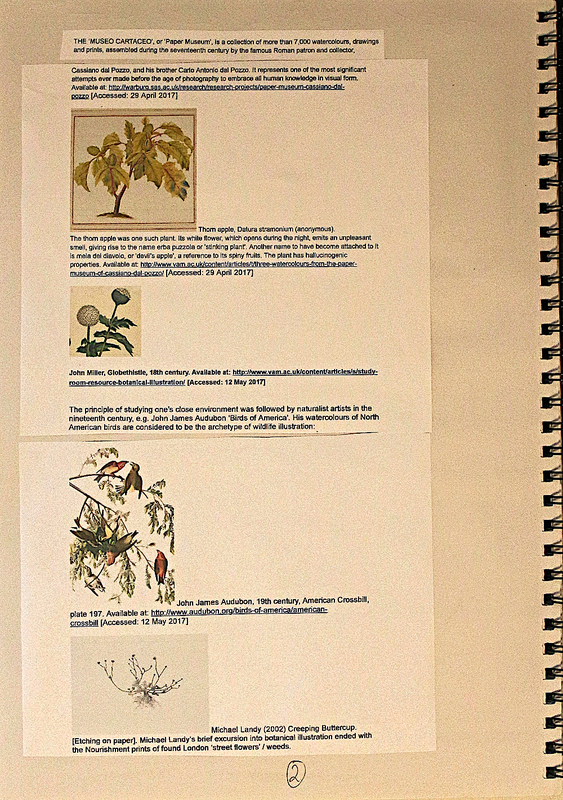 Available at: http://www.vam.ac.uk/content/articles/s/study-room-resource-botanical-illustration/ [Accessed: 12 May 2017]. The precision and detail displayed in Audubon’s work is to be admired. However, in terms of my own work, I have been gradually developing a style of painting that is less detailed and more inclined towards the painterly, gestural and even abstract. Creeping Buttercup (2002). Available at: http://www.tate.org.uk/art/artworks/landy-creeping-buttercup-p78730 [Accessed: 27 June 2017]. Again fairly detailed, showing roots and above ground spread of flower, this image draws on the history of botanical illustration. However, again I find that it is not really for me. I could, I am sure, view my own environment in this way, but this does not fit with my developing style, other than in the abstractness of the shape/form when I half-close my eyes – roots, body and arms (and legs). Available at: http://archiefranks.com/ [Accessed: 1 June 2017]. As Sally O’Reilly writes: “Luscious canvases complicate the blunter visuals that high-key leisure, with its bright lights and artificial flavourings, deliver. The encrustation of paint perverts slick mass-cultural banality and suggests a historical specificity, a subjective response. The paintings seem friendly but barbed or reticent. … The Baroque, Franks notes, fully acknowledges its own illusionism, and draws analogies with the fictional spaces of the psyche. It is this self-awareness that Franks instils in the work…” Available at: http://archiefranks.com/approach/ [Accessed 1 June 2017]. What attracts me to this painting is the vibrancy of the brush work and what Ian Sinclair observes as “Green is seductive. There’s something unnatural about its chemistry.” In: Sinclair, I. (2003) London Orbital: a walk around the M25. [e-book] London: Penquin Books, p.155. From my reading I also picked up the observation that ““Place” is a restlessly changeable phenomenon.’ In: MacFarlane, R. (2009) The wild places. [e-book] London: Granta Books, p.143. This gels with my viewing of Fragments and of my own natural environment. I have opened my eyes and my mind to what lies around me in my ‘taken for granted’ local environment and have attempted to capture something of the idea and essence of it in my work. My research notes for Part 5 are as follows. Please click on the image to enlarge it.